Ever since we previewed it at The Whisky Show in October, we’ve been receiving questions about the Karuizawa that was on our Japanese whisky stand. The wait is now over and we can announce both its launch and how we’re going to sell it. Not only that, but we’ve also got another new whisky to tell you about – introducing Karuizawa 1981 and Hanyu 2000. This was one of the stars of The Whisky Show, with a large queue forming at the Japanese whisky stand as soon as the doors opened each day. 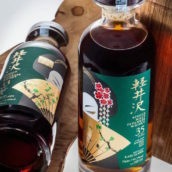 It’s matured in a sherry cask, as you might expect, and has the classic, well-aged Karuizawa character, as well as an impressive intensity of flavour thanks to its high strength. Nose: Cherry chews, maraschino cherries and warm, sweet-smelling leather. Behind that is a deep and dark combination of bittersweet chocolate, damp oak, mushroomy rancio, salted liquorice, mulchy leaves and rich, riverbank earth. Palate: Intense, with liquorice at the front of the tongue. Dark chocolate and sweet cherries step in, before fading to reveal the rich and savoury umami-laden flavours hinted at by the nose. Soy sauce, damp earth, dark polished oak and burnt raisins swamp the palate, but slowly calm to let fruity raisins and more dark chocolate shine. Finish: Powerful berry fruit and oak-laden spice to start, slowly calming down through liquorice and blackcurrant cordial to drying apple skin, with a tingle of cinnamon. That fades, leaving lingering fragrant oak and sandalwood. Comment: This shows off exactly why these Karuizawas are so sought after. It’s packed with dark, savoury oak, but has layers of fruit and spice to ensure that the wood doesn’t get too heavy. You need to be a fan of sherry-cask-matured whisky if you’re going to love this, but if you are then you will. Hanyu finally closed its doors in the year 2000, and the stills have since been dismantled, putting a very final line under the distillery’s history. 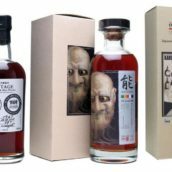 Fortunately, former distillery manager Ichiro Akuto, of Ichiro’s Whiskies and Chichibu, bought all of the remaining casks from the new owners and has been trickling them out over the intervening years. He finished his Card series of whiskies at the end of last year, with the award-winning Hanyu Joker, but we’ve managed to get our hands on a few bottles of this, distilled in the final year of the distillery’s operation. Nose: Toffee and toasted orange to start, with oat and raisin cookies, sawdust, pine resin, sweet cinnamon, polished oak and stewed sultanas developing. Palate: Rich and intense, but also surprisingly delicate. Big woody flavours provide a backbone, with oak (both sweet and sour) joined by lots of cinnamon, nutmeg and clove for a dose of spice. However, it doesn’t get too spicy, with sharp fruit – green apples with their skin and citrus touches – providing some fruity balance, before wax wood polish develops to round things out. The flavour intensity grows as it sits on the palate, culminating in a focused apple and oak punch, right down the centre of the tongue. Finish: Quite hot, with polished wood, lightly sour oak and lingering buttery spice. Comment: A complex combination of oak flavours, with woody spice and rich toffee notes mingling with both richer and sharper fruit notes. One for those who don’t mind a bit of wood with their whisky. We’ve learned the hard way that whiskies like these are very popular, with all of the bottles disappearing in seconds, leaving those didn’t click fast enough disappointed. So, we’re falling back to the fairest way of allocating bottles we’ve found so far: a draw. 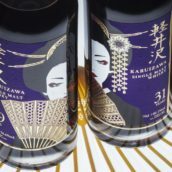 Simply register your interest in either of the two bottles by clicking through to their page (Karuizawa 1981 or Hanyu 2000), hitting the ‘Notify Me’ button and entering your email address – you can enter both draws, but if your name comes up in one then we’ll take it out of the other one. We’ll be closing the draws on Monday 26 January 2015 at 10am, and allocating bottles through the following week. There will be no obligation to buy, but if you don’t reply to an email offering you a bottle within a week, we will pass it on to the next person on the list. 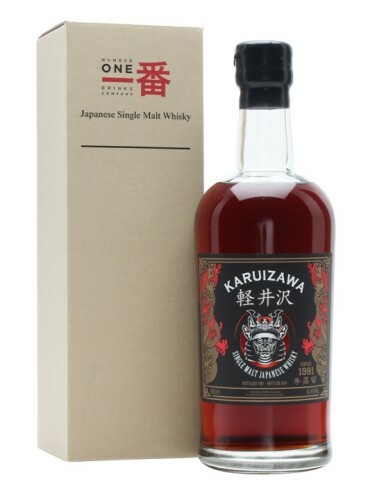 There does not seem to be a mention of a cask for the new Karuizawa. 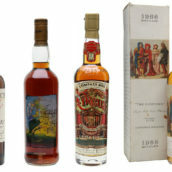 Is it a single cask or a vatting of a few casks from 1981? It’s a single cask but the cask number isn’t listed. When do we find out if allocated a bottle as part of the draw? This week – we’re working on it at the moment. Any clues on the comment – more whisky’s from Japan on the way now??? Billy, could you please tell us how many bottles coming from this cask of Karuizawa ? If I may ask, why ? Re-racking ? Re-casking ? Or just the cask is too timid to display its number ? It’s a regular single cask, but we don’t have the cask number on the label. No particular reason, as far as we know. Billy, could you please tell us how many bottles coming from this cask of Hanyu? Can you let us know when these are all gone. The final emails should go out today – we don’t expect many people, if any, to not buy the bottle. If there is any left we’ll reallocate them, but we don’t think that’s very likely. Was lucky enough to get a bottle of Hanyu!!!!!!!!!! Hello, is it already after the draw? I didn’t get eny e-mail (win or loose) yet, and none of my calleuges as well. All of the bottles have been allocated and emails have gone out to those who are able to buy one. We will email everyone once the bottles are sold, as if someone doesn’t take up the chance to buy a bottle their bottle is reallocated. Super happy having my first ever Karuizawa from TWE! !